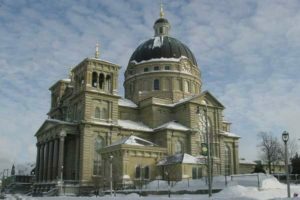 The Basilica of St Josaphat is a ministry of the Conventual Franciscans on the South Side of Milwaukee in Historic Lincoln Village. This church and parish are named for St. Josaphat, an Archbishop in the Kingdom of Poland in the early 1600s. The parish was founded in l888, and its first home was a modest building that burned to the ground in 1889. The parish built a second church but it was too small for the growing congregation of 12,000 parishioners. Father Wilhelm Grutza, the pastor, hired a German-born architect named Erhard Brielmaier to design what is, in essence, a smaller version of St. Peter’s Basilica in Rome. 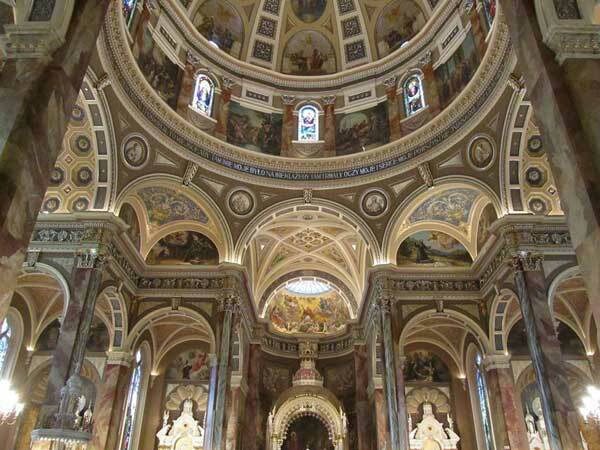 Both churches have a cross-shaped floor plan with a huge central dome. When the plans were nearly complete, Fr. Grutza learned that the U.S. Post Office and Custom House in Chicago was being razed and he purchased it for $20,000. The building was dismantled and the salvaged materials were loaded on 500 railroad flatcars and brought to Milwaukee. They were stockpiled in a vacant lot across the street. 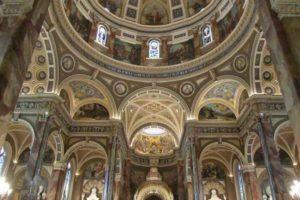 The Basilica of St Josaphat has been owned and administered by the Conventual Franciscans since 1910. The Basilica is home to numerous Franciscan Ministries including a parish and school, a weekly food pantry, and other ministries of outreach. Through the years, the Franciscans have maintained an active presence and a spiritual home for numerous members of the local community and beyond. The rose window in the pavilion highlights, clockwise from the top, St. Kateri Tekakwitha, St. Frances Xavier Cabrini, St. Katharine Drexel, and St. Elizabeth Ann Seton, with Our Lady of Częstochowa in the center. The coat of arms to the right of the rose window is that of Pope John Paul II and on the left side is this basilica’s coat of arms. Above the doors in the gathering area are reliefs of (L to R) Archbishop Katzer, Pope Leo XIII, and Cardinal Martinelli (Apostolic Delegate to the US who dedicated the church in 1901). Statues of St. Peter and St. John Vianney are opposite the doors. On the ceiling above this area in Latin: “Pater Noster Quis Es In Caelis Sarctificetur Nomen Tuum” is the beginning of the Lord’s Prayer. The painting above the east exit depicts one of the great figures of Polish history, Rev. Peter Skarga, a 17th century Jesuit, preaching before the Polish royal court. Above the confessionals are the first seven Stations of the Cross, carved from marble. The stations are inscribed in Polish. The window in this transept shows the Blessed Mother with the Infant Jesus, presenting the rosary to St. Dominic, while St. Catherine of Siena looks on. 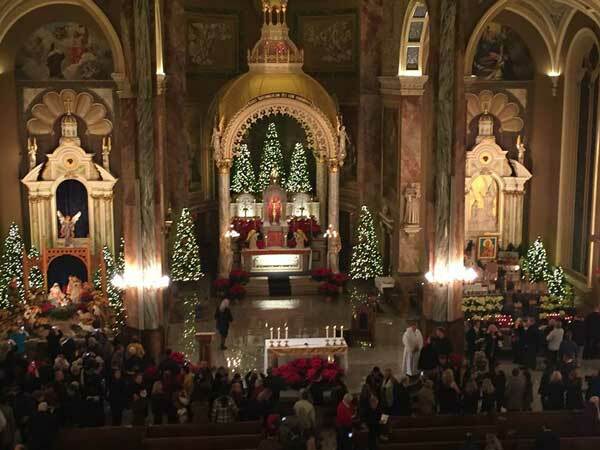 The scene is flanked by St. Thomas Aquinas on the left and St. Hyacinth on the right. The High Altar, carved of marble, holds the Tabernacle. Built over the altar is the baldachino (canopy), covered with 23k gold leaf. Inscribed in Latin is “Behold God’s dwelling place among men!” In the base of the altar is a high-relief marble image of the Last Supper, based on the painting by Leonardo da Vinci. 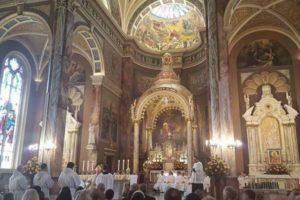 The painting behind the altar is the Martyrdom of St. Josaphat. To the left is a painting of St. Andrew of Bobola and to the right, St. Vincent de Paul. In the apse (semidomed ceiling) above the baldachino is The Glorification of St. Josaphat, containing over twenty-five figures. The Sacred Heart Altar shows St. Margaret Mary Alacoque at Paray le-Monial, France. The painting above is St. Thérèse of Lisieux. The Papal Chair is a symbol reminding us of our union with the Holy See. A statue of the Infant of Prague is behind the glass. The large statue to the right of the altar is St. Francis of Assisi. The tintinnabulum (processional bell) is reminiscent of those that signalled the approach of a papal procession. This bell is one of the privileged marks of a basilica. The Annunciation Altar holds a painted image of Our Lady of Częstochowa. The mural above is St. Dominic and St. Catherine with the Blessed Virgin. To the left of the altar is a statue of St. Anthony of Padua. The ombrellino (umbrella), evocative of those carried over imperial and papal authorities, is one of the privileged marks of a basilica. The present church is not what the Post Office and Custom House looked like. Architect Brielmaier changed his plans to include the salvaged materials, but his design remained faithful to the original model—the Vatican Basilica of St. Peter. Ground was broken in 1896 and the church was finished in 1901. At the time of completetion, the only building in the country with a larger dome was the United States Capitol. Cost overruns put the parish in major debt. 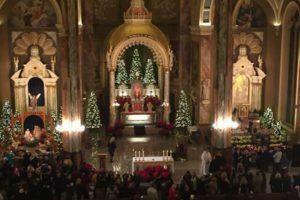 The Archdiocese searched for an order of priests that would take over the administration and debt of the parish. In 1910, the Conventual Franciscans took over administration of the parish and the debt was retired in 1925. With the debt gone, plans were made to finish the interior. The church wasn’t exactly an empty shell when it opened. The stained-glass windows were in, imported from Innsbruck, Austria. The main altar was here. But most of the building was a blank canvas, painted alabaster white. The parish hired a Roman artist, Gonippo Raggi, in 1926. His crew spent two years working on the interior. They painted the oil murals, finished the ornamental plasterwork, and painted the columns to resemble marble. 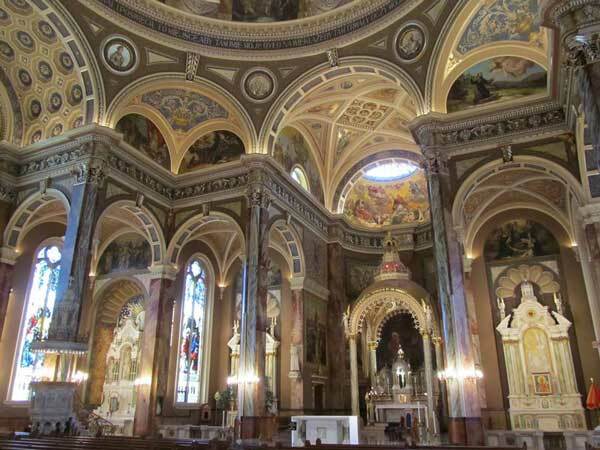 In 1929, after the interior work was finished, the Franciscans petitioned Pope Pius XI to declare St. Josaphat Church a basilica. Located in the Pope John Paul II Pavilion on the west side of the Basilica, the visitor center is open Monday through Saturday, 9:00am to 4:00pm. Walking tour brochures are available for your convenience. There is also a free exhibit of images and information detailing the story of the Basilica on the lower level of the Pavilion. Formal tour presentations of the Basilica are regularly held after the 10:00am Mass on Sundays. Simply gather in the front few pews immediately following the musical postlude (approximately 11:00am). To schedule group tours on other days of the week, please call (414) 902-3523 or click here. 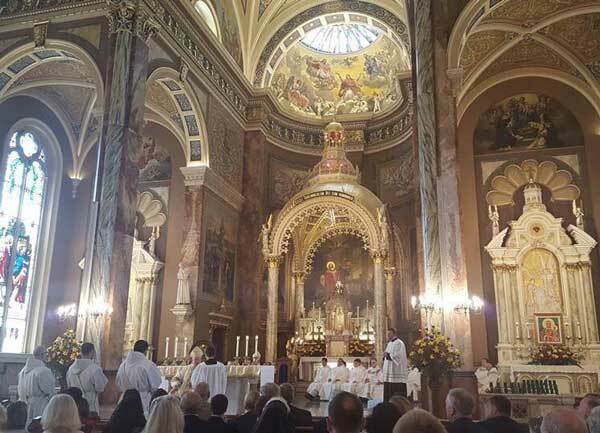 Saturday at 3:00 PM and weekdays following the morning Mass. Wednesday afternoon following noon Mass until evening Benediction. 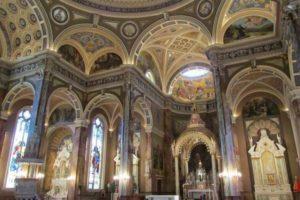 This church and parish are named for St. Josaphat, an Archbishop in the Kingdom of Poland in the early 1600s. The parish was founded in l888, and its first home was a modest building that burned to the ground in 1889. The parish built a second church but it was too small for the growing congregation of 12,000 parishioners.